The Senior Special Assistant to President Buhari on National Assembly Matters (House of Reps) and senatorial aspirant for Kano South senatorial district, Abdulrahman Kawu Sumaila yesterday raised the alarm over threat to his life by agents of his political opponent, Senator Kabiru Gaya. During an emergency press briefing held at NUJ Kano Press Centre, Kawu alleged that a former Chairman of Sumaila LGA and campaign director of Senator Kabiru Gaya, Alhaji Abdulhamid Idris Rimi, led a group of unknown persons who stormed Sumaila ward and attempted to attack him, while he was addressing over 3,000 APC supporters. They had gathered for the direct primaries of the party in the state. He said eight unknown armed men approached him at the APC’s Sumaila ward office where the party primaries was taking place and tried to attack him with dangerous weapons. 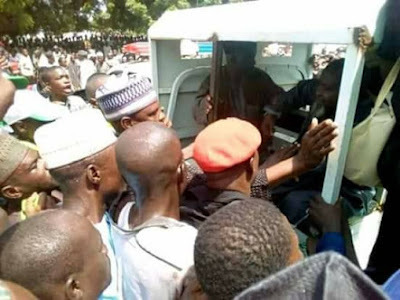 He further stated that the police later arrested two of the suspects, including Senator Kabiru Gaya’s campaign director who are currently at Sumaila police station.